All aboard for a trip that will spark kids' imaginations, adults' memories, and leave everyone smiling! It all starts at the historic 100+ year-old depot in downtown Blue Ridge, Georgia and heads north from there. 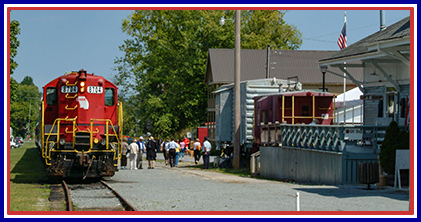 As the train winds through the mountains alongside the beautiful Toccoa River, car hosts will share the history of the railroad and sights along the way. The views are spectacular from both the vintage climate-controlled coaches and from the open-air car. Want to ride in style? Try the "Premier Class" which is available to adults 18 years and older. Need a snack? Visit the concession car for snacks, drinks, and souvenirs. After a leisurely one-hour trip, the train stops in the unique twin border towns of McCaysville, GA and Copperhill, TN. You will have time to shop, tour, and dine during the layover. Then it's back to Blue Ridge where you can purchase railroad-inspired souvenirs at the gift shop. The ticket office is in the depot tucked in the charming mountain village of Blue Ridge within the lush Chattahoochee National Forest, only 95 miles north of Atlanta. Reservations are strongly encouraged. For schedules, ticket prices, and more information, call 877-413-8724 or 706-632- 8724 or visit www.brscenic.com.